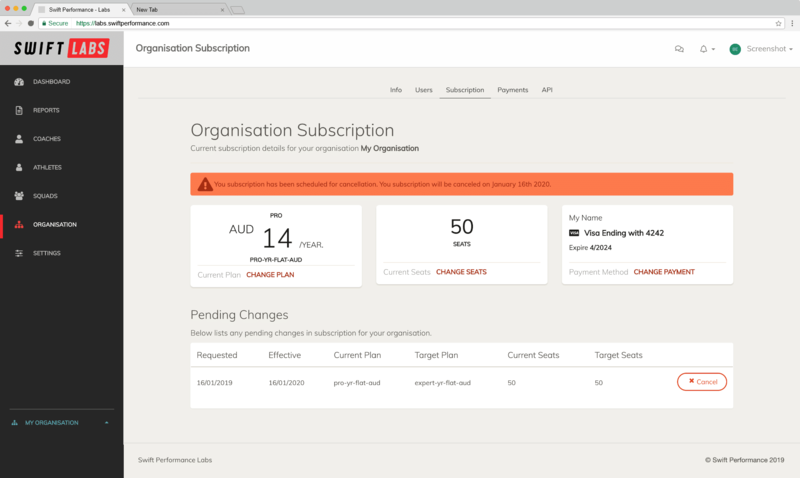 To manage all organisation subscription information, navigate to the Subscription tab within the Organisation menu on the left hand side of the application. Both subscription plan downgrades and subscription seat count downgrades follow a similar process. To change the subscription plan navigate via the Change Plan link button within the Subscription tab. 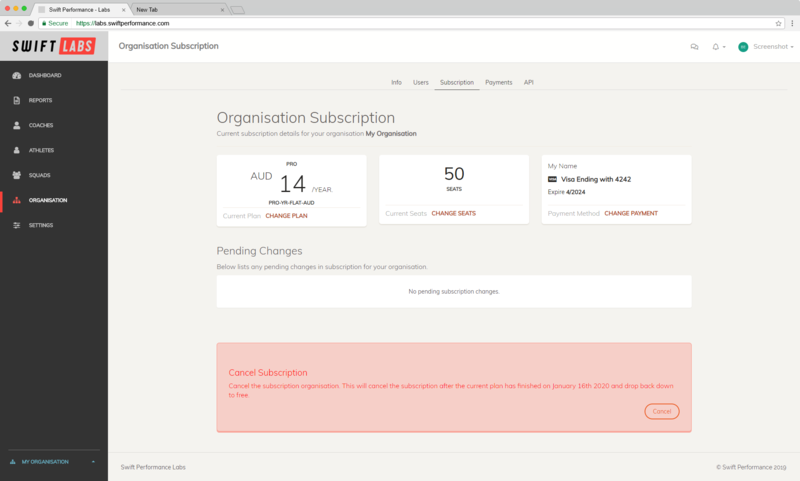 To change the subscription seats, click the Change Seats link within the Subscription tab. Adjusting your subscription to the desired plan or seat count will change the confirm button on the bottom right of the screen to Downgrade. The application will also preview the costs of the desired subscription the date in which the subscription change will be active. Clicking on the Downgrade button on the bottom right of the screen will bring up the subscription change confirmation window. 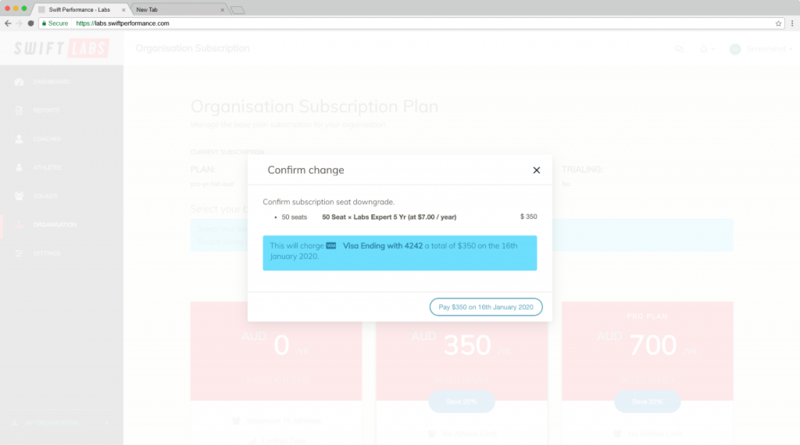 The confirmation window again confirms the cost of the subscription change, as well as the date that the new subscription will come into effect. A subscription change that results in a downgrade at the end of the billing cycle will not charge until the new subscription has come into effect. Confirming the subscription change will commit to the subscription change at the end of the billing cycle. After the subscription change has been submitted, the application will redirect back to the Subscription management tab within the Organisation menu with the updated subscription pending changes. 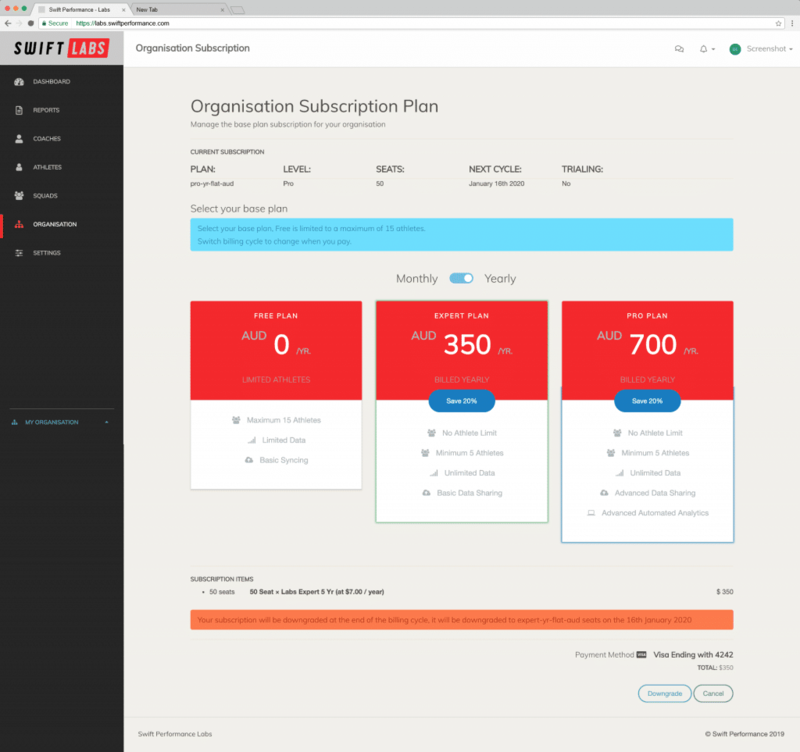 The pending changes within the Subscription tab will display the current subscription plan and the target subscription plan with the current and target subscription seat count. The pending changes table also displays the requested and effective date of the subscription change. Any additional subscription changes will be merged with the current subscription pending change and can also be cancelled at any time before the subscription effective date. If a subscription pending change is cancelled the subscription will continue on the current subscription plan and will continue to charge if a valid payment source is attached to the organisation.